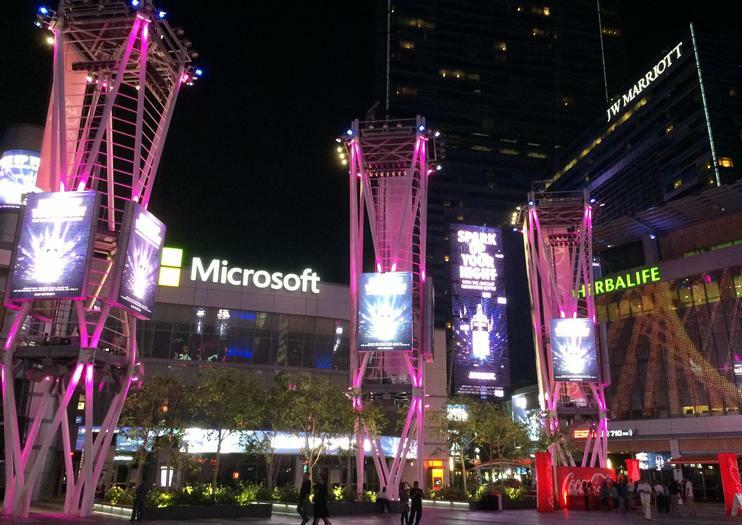 L.A. Live is at the heart of the action in downtown Los Angeles. It is the sports, music, and entertainment hub surrounding venues like the Staples Center and Los Angeles Convention Center. The energetic collection of nightclubs, restaurants, venues, movie theaters, and even museums truly has something for everyone. A few highlights include the iconic Conga Room, the Nokia Theater, and Lucky Strikes and Lounge bowling center. L.A. Live is also home to the GRAMMY Museum and its decades of music industry history. With more than twenty restaurants there plenty of dining options. Some of Los Angeles’s best luxury hotels can be in surrounding skyscrapers. Live entertainment and special events are frequent, and award shows and red carpets can also be seen here on a regular basis. The ever-modern structures and lights of L.A. Live are set to continue to expand, so we can expect much more entertainment to come out of this cultural center in years to come. LA Live is situated in downtown Los Angeles beside the Staples Center and Los Angeles Convention Center, at the intersection of Olympic Boulevard and Figueroa Street. Parking is abundant, or take the Metro Blue Line or Expo Line to the Pico Stop. From there it’s a two minute walk. Visit some of L.A.’s most famous landmarks and neighborhoods on this 5.5-hour small-group city tour. Head to the 21st Century entertainment district to see famous buildings such as the Walt Disney Concert Hall and The Broad museum. Take a photo in front of the Hollywood sign on Mulholland Drive and see the stars on the Hollywood Walk of Fame on this comprehensive tour. Get a sense for all that the City of Angels has to offer during this 5.5-hour Los Angeles city tour by coach. Join a knowledgeable guide, who provides insightful narration during your ride, as you visit such iconic L.A. attractions including the Hollywood Sign and Hollywood Walk of Fame, the Hollywood Bowl, the TCL Chinese Theatre, Rodeo Drive, La Brea Tar Pits, downtown L.A. and Walt Disney Concert Hall. You’ll also have one hour for a shopping break at the city’s famous Grove shopping mall and Farmer’s Market. This Los Angeles sightseeing tour also includes morning and afternoon departure options. See Los Angeles in style with a 5-hour private tour in a spacious vehicle. Watch for celebrities as you cruise the Walk of Fame past the iconic Chinese Theater, and navigate the roads of Beverly Hills as you spot the stars’ sprawling mansions. Continue along Rodeo Drive and the vibrant Sunset Strip, then hit downtown to see the city’s most famous sports centers, concert halls and museums. Finish your trip at the Pacific Ocean, where you’ll take in Venice Beach, the Santa Monica Pier and miles of perfect, palm-lined beaches. Double your fun in Los Angeles thanks to this flexible-length trip combining a Malibu stars’ homes tour and a hop-hop, hop-off sightseeing bus excursion. Explore more than 40 homes owned by Hollywood’s most famous celebrities of the past and present. Then enjoy 48 hours of access to a hop-on, hop-off sightseeing bus featuring more than 70 top LA attractions. The sprawling size of Los Angeles is notoriously difficult to navigate. Customize your own itinerary without the hassle of driving on a private tour of downtown highlights with round–trip transport from the doorstep of your accommodation. Going with a guide ensures you never miss a landmark, as well as leave with a new knowledge of LA’s history, culture, and celebrity life. Explore Los Angeles on a full-day tour that covers the best of the sprawling city. Hear commentary from your guide as you take in Muscle Beach, Venice Beach, and Santa Monica Pier, then cruise through Hollywood to the Walk of Fame, TCL Chinese Theater, and Dolby Theater. Get a look at Beverly Hills' celebrity mansions, Rodeo Drive, and the Sunset Strip. Continue to downtown Los Angeles to view landmarks like Walt Disney Concert Hall, L.A. Live, Bradbury Building, and more. Ideal for travelers with limited time. Get a comprehensive overview of Los Angeles and its surrounding areas on this 2-day private tour. Each day is split up into 5-hour walking tours that cover a range of landmarks including City Hall, Walt Disney Concert Hall, Grand Central Market, Rodeo Drive, the Hollywood Walk of Fame, and much more. Discover some of L.A.’s hidden gems and learn about the history of the city from your guide. Explore the best of L.A. with this 3-day tour. In downtown Los Angeles, visit the Walt Disney Concert Hall, the Bradbury Building, the Central Library, and more. Lunch in the Farmer’s Market and see the city skyline. On day 2, visit Rodeo Drive, The Grove, Sunset Strip, and the Hollywood Walk of Fame. Stroll along the Santa Monica Pier and admire coastal views on the final day of your tour.